I might have gone overboard with the Barry M glitter nail paint! 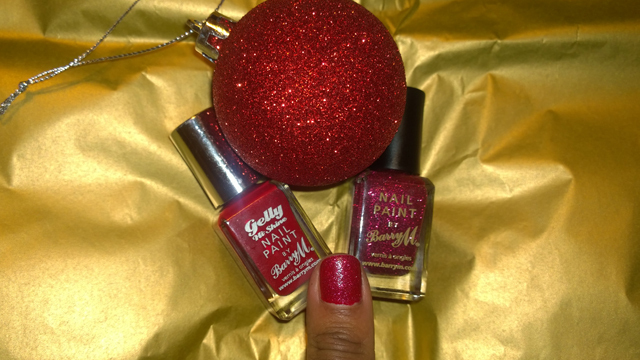 The first combination I have tried is Barry M Ruby Slippers Nail Paint over Barry M Gelly Hi-Shine Nail Paint in Blood Orange. Ruby Slippers is a very pretty micro glitter in true red. It really does bring out the Dorothy in you – I want to find a yellow-brick road! The glitter is so fine I would wear it at any time of year. In fact, I need more glitter to be in a Christmas mood so I’ll be changing this soon for something more bold. I used base coat, one coat of Blood Orange, one coat of Ruby Slippers and topcoat. Yes, please believe I only needed one coat to match my Christmas baubles. I was quite impressed! Without topcoat it is like OPI liquid sand (I’ll tell you more about this in another post) – relatively quick drying with no need for topcoat but almost matte. However, unlike liquid sand I found that topcoat gave the glitter/shimmer a boost giving it the shine I wanted. I love Barry M Nail Paint in Ruby Slippers because of its versatility. Without topcoat you get a nice textured shimmer which is surprisingly subtle. With topcoat you get a shiny, glittery effect which is good for those who want to add pizzazz to their nails without feeling like it is too much. Unfortunately I just couldn’t capture this with my camera so you’ll have to take my word for it!